Thursday 28th January, after having to cancel the planned Tuesday outing due to bad weather – 40+mph winds on waters surrounded by large trees are not a good place to be even discounting the technicalities of the actual fishing – I was back at the pool I visited on the previous session (VV). Arriving at the water around 0815, I baited up the swim with a few small balls of groundbait laced with maggot and throughout the session I catapulted out a few maggots at half hourly intervals and the occasional small groundbait ball. The first cast of the day was made at around 0900 and I tackled down at 1430. I fished, again, with 2 ledger rods – 8lb line – using worm/maggot on a size 12 hook on one rod and bread originally but later swapped to prawn on a size 8 hook on the other. A few takes were received on both rods but in general were short pulls, too quick to strike at, but one fish did make it to the bank – a 2lb 0oz tench – caught at 0950. I was amazed though that water temps over the five days since my previous visit had increased quite quickly – by 2.0C on average as on the previous visit I measured temps around 5.3C and the temp on this session was averaging 7.3C. Saturday 23rd January saw me take an unusual day’s fishing for me. I don’t usually consider fishing at weekends as from experience from years ago the whole of the working population appeared to set out for the banks and arrival post-0700 meant usually scrabbling to find any swim rather than a decent swim. However, having missed a normal mid-week’s session or two I thought I’d go out anyway – and was pleasantly surprised on arrival at about 0815 that the chosen multi-species (bar pike) pool (VV) was devoid of any other personage… and remained so all the time I was there – leaving at 1400 due to the chilly southerly breeze at my back starting to get through to me. I fished 2 11’ rods (‘Avon Plus’, 1.75lb TC type), ledgering with 8lb mainline to 6” 8lb braid hooklengths, 5g leads on bite alarms – one rod with size 12 hook baited with maggot or maggot/worm cocktail, the other rod with a size 8 hook baited with salted prawn and, later, cheesepaste (5 year old, stinks to high heaven). I fed maggot, small meat cubes, and small cheesepaste balls and fished tight to the bank of the island shown in the photo and also fed/fished the mid-channel areas. Anyway, suffice to say over the whole session I had only one single ‘beep’ of my alarms…and the usual blank. Tuesday 12th January saw Liz and I set off at 0745 to Pike Pool 1 in search of Esox Lucius again. Another cool morning with air temps varying between 6.8C and 7.0C and a consistent water temp of 7.0C with a northerly wind into our faces (second mistake of the day – first mistake was probably leaving the house in the first place, LOL!). Eventually though the rain ceased and blue skies and sun ensued, however not enough to counterattack the in-the-face-cold-breeze…. Sunday 10th January was a trip out to a previously unvisited water in the depths of Shropshire. I’d heard that the water is a mixed fishery with various species including ‘match sized’ carp. The pool itself was a chocolatey colour – whether due to carp foraging or due to run off from the land due to the wet conditions is not known. As seen in the aerial view photo, there are also 5 islands within its bounds. I fished facing across to the just past the north end of the central island from the east bank (see photo 1), with a sometimes stiff breeze coming up from the south, a condition that changed my mind from originally intending to float fish over to setting up 2 ledger rods. Temps on the day were quite cool with air temps barely reaching 6C – and in fact in the 15 minutes between 1145 and 1200 the temp dropped by 2 degrees from 5C to 3C… Water temps were mostly consistent at 5.0C-5.2C. Before fishing I used my ‘Lucky’ fish/depth echo sounder to check out depths in front of me and found that just in line with the island the water depths were around 4.5’ rising to 3.9’ for most of the rest of the way back to the bank but about 2-3 rods length out from the bank there was a drop to 6’-7’ for about a metre’s distance… and the sounder was also picking up fish in this depression which it had not done in the previous part of the scan. I suspect that this was actually a channel running parallel to the bank but not sure as I didn’t do readings further along the bank, etc. 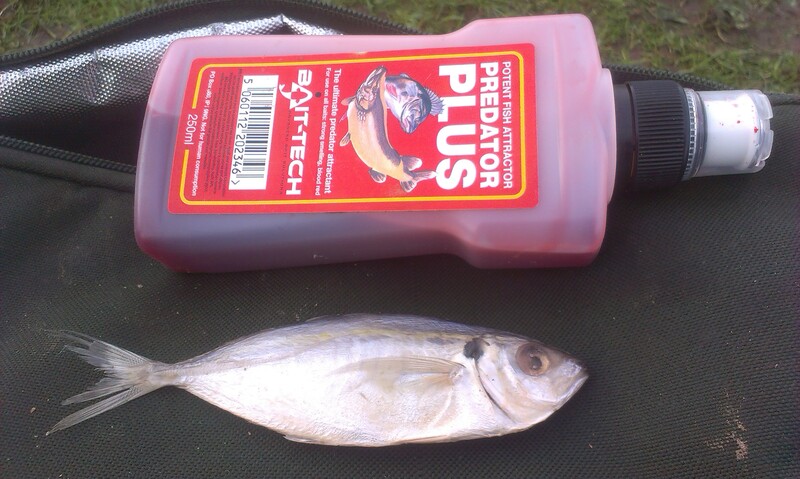 Actual bait-in-the-water fishing was partaken from around 0845-1300. Two ledger rods were set up with 8lb line, light 4g leads and initially size 12 hooks, one baited with worm and the other with maggot and fished with bobbin/buzzers into the deep hole/channel and fished this way for the first couple of hours with small quantities of maggots catapulted into the swim at intervals. Quite a few small tugs ensued on both rods and one small silver was landed plus two others were dropped off the hook. For the final couple of hours I switched to size 8 hooks and larger baits – small cube of meat on one rod, a half prawn on the other but not one bite was detected. Session 3 which occurred on Sunday 10th January and Session 4 undertaken on Tuesday 12th January will appear shortly – currently lacking the time to write them up but hopefully will appear tomorrow Thursday 14th or Friday 15th. Thursday 7th January 2016 saw me head off to the wonderful Shropshire Union Canal at a location somewhere between its confluence with the Staffs-Worcs Canal at Autherley Junction and its confluence with the River Mersey at Ellesmere Port…. So… the forecast had said rain stopping at 0800 – so I set out at 0730 with a few spots still in the air and with even that having ceased upon parking the car I headed about 400 yards up the canal to my first chosen area for the day… and, having barely set the rod up, a heavy drizzle started which continued without pause until 1100 by which time I was drowned (didn’t take the brolly – forecast being ‘no rain’ after 0800??) and cold… I admitted defeat, tackled down and headed back to the car arriving there at 1120 to see, yep sireeee, blue sky appearing in the distance… and whilst driving home by 1145 there was no rain, just golden sun and blue sky… yep, as per usual!! The final swim, tried for an hour, was one about 100 yards further up the canal with a far bank featuring an overhanging bush and some exposed underwater roots…. However, as per the norm, neither swim elicited any form of action at all…. Friday 1st January 2016 and I opened my new year of angling with a short spinning session on the Staffs-Worcs Canal with me fishing from 0700 until 1000. The time was fixed really by having to drop Liz into work at 0630 and collect her again at 1100. I had originally decided to fish the stretch of the canal at Wombourne between Awbridge (Ebstree Lock) and down to below Bratch Lock – and then realised my Wolverhampton AA card expired on 31/12/15. So I decided to bring my new Birminham AA card in to play and fish from Botterham Lock (Wombourne), where the water changed from WWA control to BAA, and down to Swindon village. I did actually arrive at the canal at just after 0700 but it was far too dark to fish and so I decided to walk to the far end of the stretch I wanted to fish and then fish my way back up to the car – and I did this and walked down one more lock length to the next lock after Swindon village – but even then I arrived there in darkness. So out came the flask and a 15 minute coffee session ensued until it became light enough to actually fish at 0800. A nice morning with overnight temps of around 2C having given rise to a nice frosty covering on the bankside vegetation. So, fishing an 8’6” (10-40g rated) spinning rod with 30lb BS braid and 30 wire trace, I started with a small blade spinner and worked my way up a couple of hundred yards of the canal without sight or scale of a fish and then changed to a slightly larger (heavier) spinner on the grounds that maybe the original was fishing too high in the water despite adding a 2SSG shot to the upper trace. Anyway, to cut a long story short – I blanked – again. And I also saw a fish (probably a carp or bream though) head-and-tail by an overhanging bush and that had me spend 5-10 minutes casting around the area – again to no avail. Other than those sightings the canal was still and undisturbed – and I only saw 4 people in all the time I was there – 3 walkers and 1 jogger. Anyway – as I maintain, for me it was a 70% day – just being on the water makes a session 70% perfect in my book – with additions for any fishy stuff! LOL! BTW… I mention ‘jacks’ in my blogs – but these are not ‘jack pike’, they are more like miniature skipjack tunas of 3”-4” in length. Extremely tough – you can get through a whole session with one (obviously if not taken by a pike), take it off the hook(s), re-freeze and use again on the next session … and the next… and the next… 🙂 Bought from Birmingham Fish Market in bags of around 20-30 per bag at £4 per bag or £6 for 2 bags.